Gary Smorgon House, Montefiore Homes, and Smorgon Family Nursing Home provide residential respite care to enable carers to take vital time out whilst being assured their loved one is receiving the highest quality care in a supportive, inclusive, heimish environment. Jewish Care Residential Respite services may be suitable for people who need extra care whilst they are unwell or recuperating after spending time in hospital, or at times when their regular carer is unable to provide the support they need. Seniors may spend one week to several weeks at one of our fully accredited aged care residences. Eligibility criteria applies. 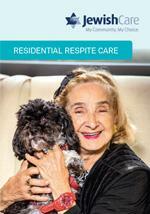 Jewish Care In-Home Respite is available through our In-Home Services. In-home respite enable carers to take planned respite to care for their own wellbeing whilst ensuring their loved one is cared for in the comfort of their own home. With a range of flexible care services and supports, Jewish Care In-Home Respite is tailored to the individual needs of carers and their loved ones. Fees apply. It is important that carers and families take time to care for their own health wellbeing. Jewish Care Day Respite services enables seniors to participate in leisure activities, pursue interests, and connect with new friends. The Jewish Care day respite activities enrich the lives of seniors and provide carers with peace of mind, knowing their loved one is participating in enjoyable activities whilst they take important time out. For more information about Jewish Care Aged Care Respite services, contact our Jewish Care Front Door on (03) 8517 5999 or submit an online enquiry.